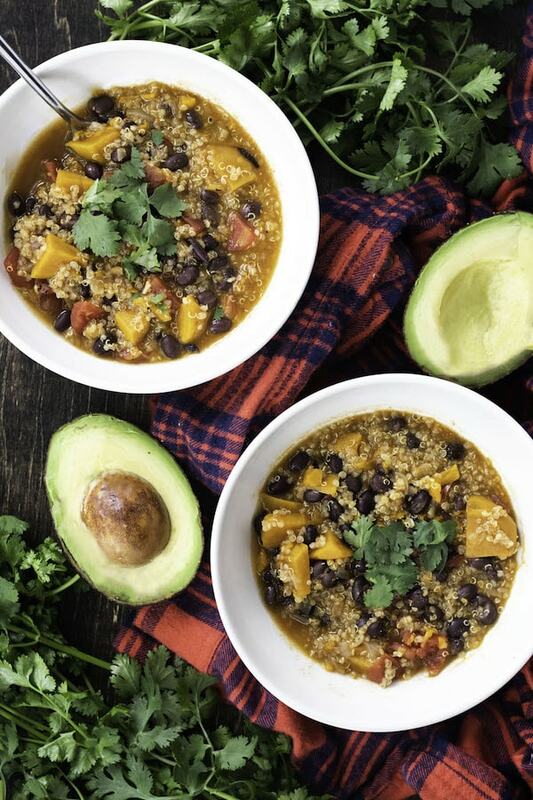 Healthy & hearty chili made with sweet potatoes, quinoa, black beans and smokey southwestern flavors. Can be ready in under 20 minutes, is vegan and gluten free. Weeee! I have to admit, I’m not much of a chili person. Something about kidney beans really grosses me out. Don’t get me wrong, I love every other type of bean, except those mushy little kidney bean guys really just bug me out. 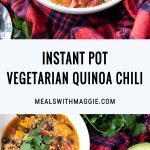 However, as you may have guessed, this instant pot vegetarian quinoa chili is kidney bean free! It’s full of spicy and smoky flavors from the smoked paprika and fire roasted tomatoes. The best part? 3 minutes in the instant pot. 3 MINUTES, PEOPLE. Cray-zee. If you don’t have an instant pot,that’s cool too. You can do it on a stove top but it will take you about 20-30 minutes to cook the sweet potatoes and blend the flavors. This recipe was adapted from one of the first recipes I’ve ever made from Eating well. Side note, I used to print out pages of their recipes and keep them in a huge binder when I was in college! 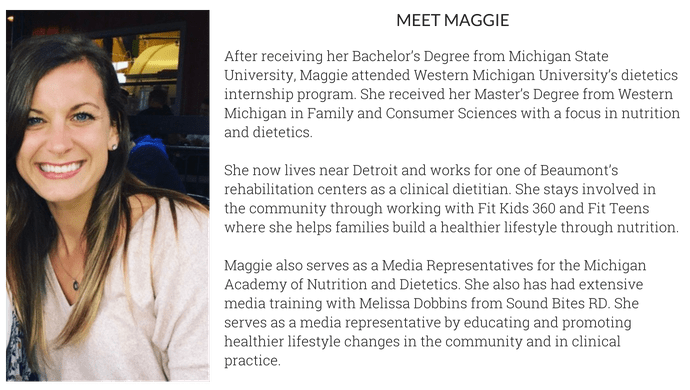 This was before blogging was a big thing and people just started to utilize google for recipes. Wow, that makes me feel so old, but it was only 2010! Quick cooking: You can cook frozen chicken in about 12 minutes flat. It takes about half that if it’s already thawed. One time I roasted a 4 pound pork shoulder in an hour and half. 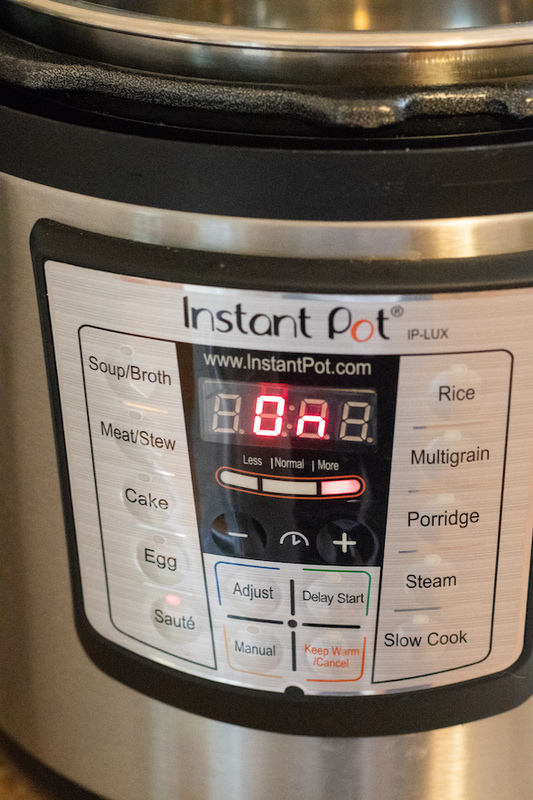 Set it and forget it: Probably my favorite function about the instant pot. You don’t have to stir, adjust temperature or worry about it boiling over. So your time is free to do other things. Multi-function: Along with pressure cooking, it has 6 other functions that really provide a nice dollar point for under $100 on Amazon. Easy clean up: Makes your meal in literally one pot! Takes time to build pressure: Even though you can cook things extremely fast in an instant pot, it does take some time to build up pressure in the chamber. Sometimes it can take up to 15 minutes. 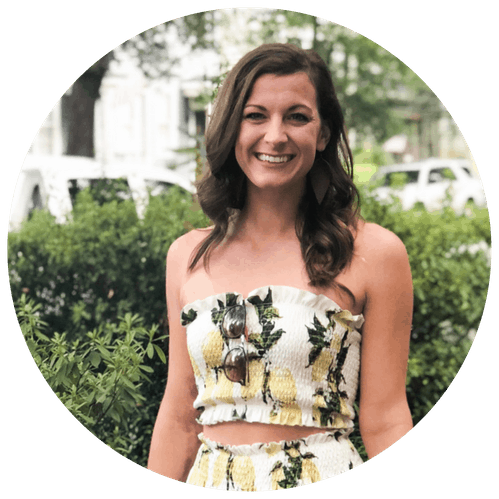 Sometimes too much of a good thing is bad: Despite having multiple functions, it can be confusing to the consumer on how to use all of them seamlessly. It does come with a user manual, but the directions aren’t always straightforward. Takes up a lot of space: I have a smaller kitchen and not a ton of storage space. So, it does take up quite a bit of space. I have to store it in the hallway closet when it’s not in use. In this recipe, I sautéed the garlic, onion and sweet potatoes before adding the quinoa and closing the lid to cook. Again, one pot wonder! 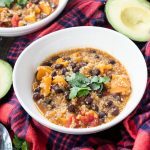 Did I mention this instant pot quinoa black bean chili is gluten free, dairy free and vegetarian? It has 25g of protein and 20g of fiber! The recommended dietary intake is 25 grams of dietary fiber a day! Yassss. 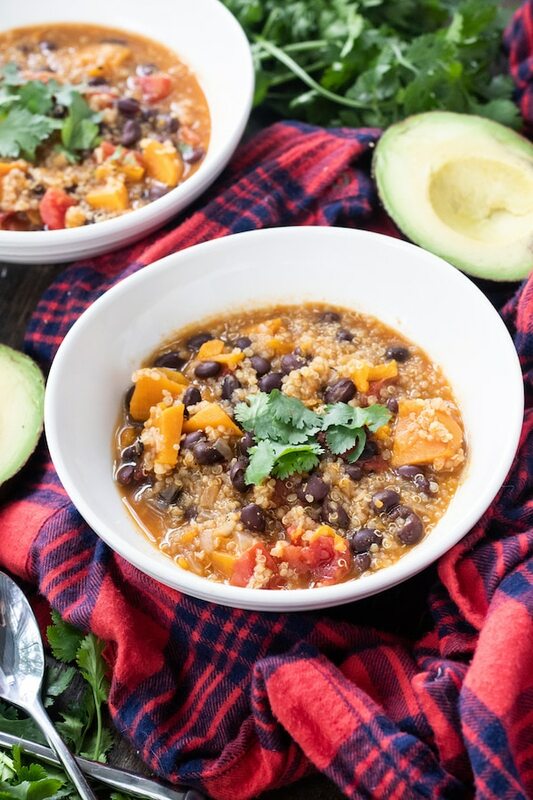 Healthy & hearty chili made with sweet potatoes, quinoa, black beans and smokey southwestern flavors. Can be ready in under 20 minutes, is vegan and gluten free. Turn instant pot to SAUTE setting and place garlic and diced onion in the pot. Once fragrant, add in sweet potatoes, spices and salt, stirring to combine. Pour water into pot and add quinoa and mix so that the quinoa isn’t sitting on top of the water. Close the instant pot lid, press the MANUAL button and set the time for 3 minutes. The instant pot will begin to build pressure. Make sure the dial on top is turned to SEALING. After the pressure builds and 3 minutes are up (the instant pot will beep) you can move the dial on top to VENTING. Allow the instant pot to fully release the pressure before opening the lid. Once the lid is open, stir and add in the remaining ingredients. Stove top: Same order and steps but cooking times will vary. Crockpot: Place all ingredients in crockpot and cook on high for 3-4 hours or low for 6-7 hours. This recipe will yield a more stew like chili, if you like your chili more soup like you can add more water.